Just a few years ago, next to my desk you’d find a stack of CD-R’s or DVD-R’s that I would use for backup Today, it’s a stack of Internal hard drives. I initially purchased internal hard drives’s for use inside my Mac Pro, but since I’ve discovered USB drive docks, I’ve been using them to back up all the computers in my office. They’re not ideal for long term archiving since every hard drive will eventually fail, but right now nothing matches the cost, storage size, and convenience of hard drives. 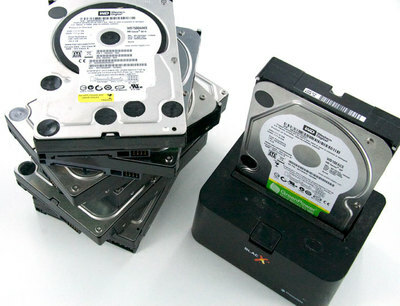 Because hard drives are relatively cheap, I keep two backups of my most valuable data- things that can not be replaced, pictures, home videos, important documents etc. Right now at Amazon, you can pick up a 2 Terrabyte drive for about $80.